P.J. 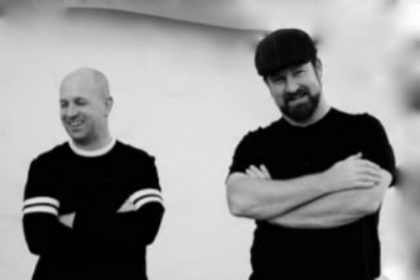 Kinzler (left) has been playing bass since his mid-teens and has been involved in several musical projects, varying from trip-hop to folk to post-rock. He is currently collaborating and constructing songs and creating low-frequency vibrations on bass in fortune my foe. Mark Kinzler (right) has been playing guitar and piano since an early age and has been writing music since his early teens. His musical projects have been greatly varied, from noisy post-punk, to fake folk music, to currently writing rock songs on a classical guitar for fortune my foe. Lea Detlefs was given a violin at the age of seven by her grandfather, and between him and a neighbor who happened to be a retired violist from the Detroit Symphony, her musical education began. She studied violin performance at the University of Michigan School of Music under Yehonatan Berick, and subsequently played with the Dearborn Symphony. She has been playing violin for over 24 years and viola for 20. Since coming to the Live Music Capital she has branched out into folk, Appalachian fiddle, and rock. She teaches violin and viola lessons full time at Make Waves Violin & Viola in Cedar Park. Alongside his early classical percussion training, Blake Brunson has played percussion continuously in various bands for about fifteen years. Since living in Austin, he has played with several rock bands, Latin jazz ensembles, and a Zimbabwean marimba band. His thirst for versatility continues as he weaves elements of rock, jazz, and concert percussion into the sounds of fortune my foe.